Located in the heart of downtown Edmonton, the Edmonton Convention Centre is within walking distance of many nearby parking lots and parkades. In addition to metered parking along Jasper Avenue and connected side streets, there are three nearby parkades/surface parking lots just next to the venue. Reserved parking is available in select lots (subject to availability), including the underground Canada Place parkade directly connected to the convention centre. For information on traffic restrictions or road closures directly affecting the Edmonton Convention Centre, visit the Facility Updates tab above. Please be aware that EPark hours of operation in existing downtown zones will extend from 6 p.m. to 10 p.m. on Rogers Place arena event nights, at a rate of $3.50 per hour. The two hour parking limit in these areas will also be extended to five hours after 5 p.m. on event nights. For a complete list of events at Rogers Place arena, please visit their events calendar. Weekdays: Mon-Fri 6:30 a.m. – 10 p.m. Weekends: 7:30 a.m. – 11 p.m.
No refunds. No “in and out” privileges. Rates are subject to change. City of Edmonton meters now accept credit card or can be paid through the MyEPark Edmonton Parking App on iPhone or Android. All parking rates are subject to change. The Edmonton Convention Centre is proud to embrace Bike Culture and encourages all guests to utilize our escalators to take their bikes up to Jasper avenue or down to the River Valley. 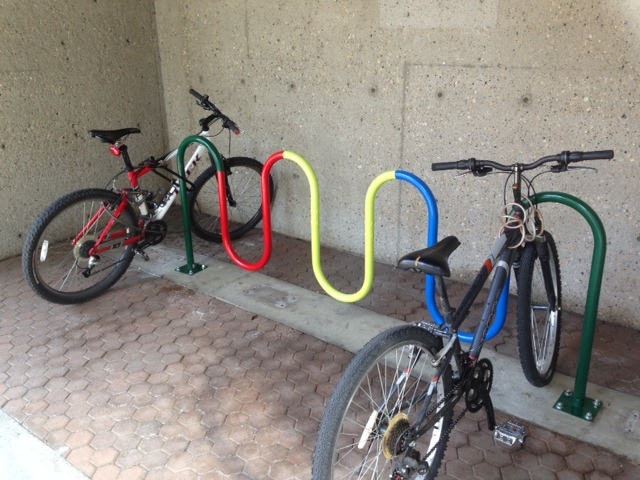 If you’d like to park your bike, please utilize the bike racks located on the west side of the Jasper Avenue entrance (in front of Edmonton Welcome Centre) or next to the Assembly level entrance.